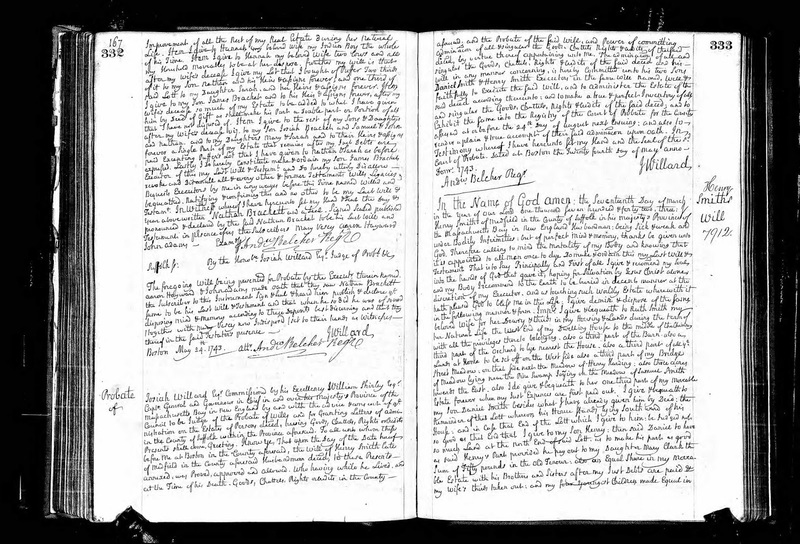 Genea-Musings: Amanuensis Monday - Post 320: Will of Henry Smith (1680-1743) of Medfield, Mass. Amanuensis Monday - Post 320: Will of Henry Smith (1680-1743) of Medfield, Mass. thereof in the Said Testator's presence. Massachusetts, Wills and Probate Records, 1635-1991, indexed database with digital images, Ancestry.com (http://www.ancestry.com), Suffolk County, "Probate Records, Vol 35-37, 1740-1745," Volume 36, Pages 333-335 (images 512-513 of 927), Henry Smith will, 1743. Henry Smith had nine children by three wives - Daniel Smith (1706-1749) by his first wife Deborah Pratt (1684-1706); Mary Smith (1709-1770), Henry Smith (1711-1785), Jonathan Smith (1714-1784), Sarah Smith (1717-1748), and Benoni Smith (1725-1752) by his second wife, Mary Adams (1681-1725); Ruth Smith (1730-1813), Moses Smith (1732-1806), and Asa Smith (1740-1795) by his third wife, Ruth Barber (1696-1761). His first two wives died shortly after giving birth to their last child, but the children lived. Note that Mary's last child was named Benoni, which usually signifies a time of sadness. Henry Smith named his third wife, and all nine of his children in his will, dividing the property evenly between all of them. Sons Daniel and Henry, and daughters Mary and Sarah, had married by the time he wrote the will, and he had, apparently, provided some land by deeds. He left his wife Ruth her dowry and her thirds, for her natural life, and not until she married again. I have no record that indicates that Ruth married again. There is no indexed entry in the Massachusetts Wills and Probate Record database on Ancestry.com for Ruth Smith. 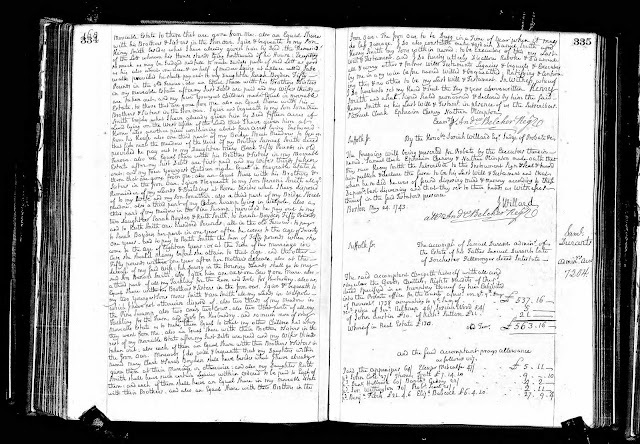 There may be other probate records for Henry Smith - perhaps the inventory, a distribution and an account. There may be guardianship records for the four youngest children in the probate records. I need to check for those also but haven't done so in the Ancestry database by browsing the Suffolk County Probate Docket index. Perhaps the most interesting item in the will is the equal sharing of the "Iron Oar." There must have been a mine or quarry on the Smith property that was worked by the family and perhaps others. Henry Smith (1680-1743) is my 6th great-grandfather, and I descend through his son Moses Smith (1732-1806). Moses Smith, who was age 11 when his father died, was to receive his father's lands in Walpole with his younger brother, Asa. Moses married Patience Hamant in 1762, a year after his mother died. I wondered how or why Moses had settled in Walpole, to the southwest of Medfield, and this is probably the main reason - he was bequeathed land from his father.